This month, we are happy to report on the recent visit of the Executive Secretary of the CBD to our offices at UNU-IAS. This newsletter also contains a reminder of the soon-approaching deadline for the Call for Proposals for SDM 2017, and we would like to share information about our upcoming parallel session at the ISAP2017 conference, plus a report from the recent IPSI Case Study Workshop, both in Japan. We recently received news of the latest “GEF-Satoyama Project” newsletter, and a news article related to IPSI. Finally, we are very pleased to include a profile of one of IPSI’s newest members. Staff of the IPSI Secretariat were recently honored to meet Ms. Cristiana Paşca Palmer, who assumed office as Executive Secretary of the Convention on Biological Diversity (CBD) earlier this year, during her visit to the United Nations University Institute for the Advanced Study of Sustainability (UNU-IAS) in Tokyo. Prof. Kazuhiko Takeuchi, Senior Visiting Professor at UNU-IAS, had a chance for an in-depth discussion with Ms. Paşca Palmer, in which he explained the Satoyama Initiative and IPSI, and our contributions to CBD processes, and discussed future developments and opportunities for further cooperation. We look forward to continuing to work closely with the Executive Secretary and other staff at the CBD Secretariat in order to make sure that the Satoyama Initiative is an effective tool for the benefit of biodiversity and human well-being. The IPSI Secretariat at the United Nations University Institute for Advanced Studies (UNU-IAS) and the Institute for Global Environmental Strategies (IGES) are pleased to announce the hosting of a parallel session on “Transformational Changes: Putting Sustainability at the Heart of Action” during the ninth International Forum for Sustainable Asia and the Pacific (ISAP2017), on Wednesday, 26 July 2017 in Yokohama, Japan. While the Satoyama Initiative functions at all levels from global to local, it is at subnational levels and scales of action that the transformational changes begin. Local policies and actions are required to overcome specific issues that communities and societies are facing as well as to achieve multiple Sustainable Development Goals (SDG), including SDGs 14 (‘life below water’) and 15 (‘life on land’). This parallel session will present ongoing work with the goals of sharing knowledge and fostering further action. For more information on ISAP2017, please see the IGES website here. A workshop was held by the IPSI Secretariat along with IPSI partner the Institute for Global Environmental Strategies (IGES) from 28 to 30 June 2017 at the United Nations University Headquarters in Tokyo, Japan as part of the process toward the publication of the third volume of the “Satoyama Initiative Thematic Review” (SITR vol. 3). The theme of this year’s workshop was “Livelihoods and socio-ecological production landscapes and seascapes (SEPLS)”, covering production activities that are based on natural resources in SEPLS, and that are practiced as subsistence and income generation for the well-being of local people. The objective of the workshop was to share case studies among the SITR vol. 3 authors and get feedback on their manuscripts for further improvement. Concrete proposals and examples on how and under what conditions livelihood activities in SEPLS can contribute to local socio-cultural and economic conditions, and how they can connect to peoples’ well-being while supporting biodiversity were presented and discussed. The SITR vol. 3 is planned for publication later this year, and will have the same theme as the workshop, including write-ups of the case studies presented and a synthesis paper aimed at bringing together the various projects and extracting lessons learned. 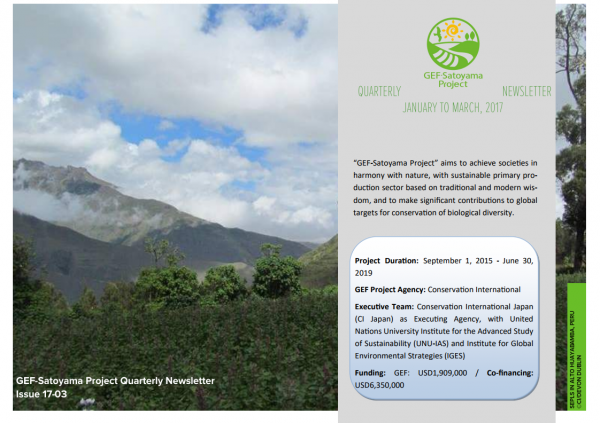 The GEF-Satoyama Project recently produced its third quarterly newsletter, including recent activities of the Executive Team and updates progress in implementation by partners in the field. 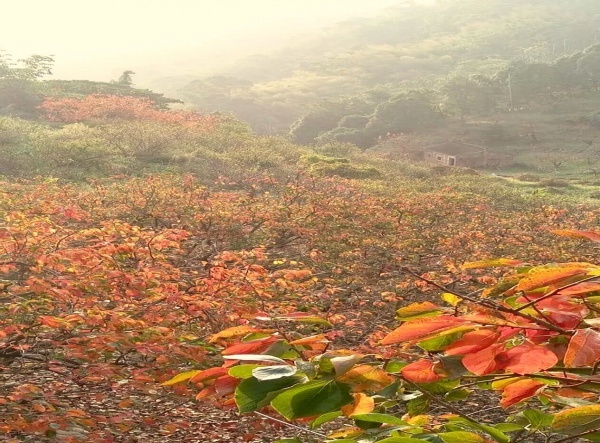 IPSI member National Dong-Hwa University recently informed the Secretariat of a Taipei Times article on their “Forest-Mountain-Borough-Sea” project, which, as the article points out, borrows from concepts of the Satoyama Initiative. The project is an excellent example of bringing together upstream and downstream communities for sustainable management of a terraced-rice-paddy ecosystem for the benefit of local communities. For the full article, please see the Taipei Times website here. The Soil and Water Conservation Bureau (SWCB), Council of Agriculture, Executive Yuan, formally established in 1989, is the Chinese Taipei authority for water and soil conservation. In compliance with the 2012 policy plan of the Executive Yuan, the SWCB is responsible for promoting comprehensive slopeland management and debris flow disaster prevention, improving land use, implementing the Rural Regeneration Act and revitalizing agricultural villages. The SWCB kindly reports that it believes the Satoyama Initiative is a useful tool for rural regeneration, and that it would like to actively participate in IPSI for the benefit of biodiversity and human well-being, locally, regionally and internationally. For more detailed information on SWCB, please access its website here.